Disney’s research hub is developing electrostatic displays, like this jellyfish, that you can actually feel. 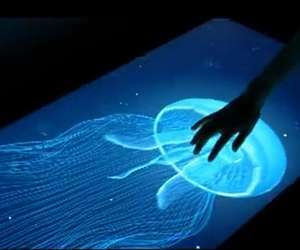 Imagine feeling a slimy jellyfish, a prickly cactus or map directions on your iPad mini Retina display, because that's where tactile technology is headed. But you'll need more than just an index finger to feel your way around. New research at UC Berkeley has found that people are better and faster at navigating tactile technology when using both hands and several fingers. Moreover, blind people in the study outmaneuvered their sighted counterparts – especially when using both hands and several fingers – possibly because they've developed superior cognitive strategies for finding their way around. Bottom line: Two hands are better than one in the brave new world of tactile or "haptic" technology, and the visually impaired can lead the way. 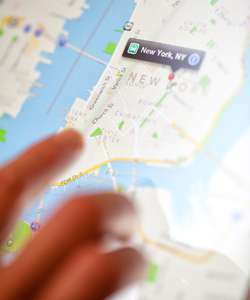 "Most sighted people will explore these types of displays with a single finger. But our research shows that this is a bad decision. No matter what the task, people perform better using multiple fingers and hands," said Valerie Morash, a doctoral student in psychology at UC Berkeley, and lead author of the study just published in the online issue of the journal, Perception. "We can learn from blind people how to effectively use multiple fingers, and then teach these strategies to sighted individuals who have recently lost vision or are using tactile displays in high-stakes applications like controlling surgical robots," she added. For decades, scientists have studied how receptors on the fingertips relay information to the brain. Now, researchers at Disney and other media companies are implementing more tactile interfaces, which use vibrations, and electrostatic or magnetic feedback for users to find their way around, or experience how something feels. In this latest study, Morash and fellow researchers at UC Berkeley and the Smith-Kettlewell Eye Research Institute in San Francisco tested 14 blind adults and 14 blindfolded sighted adults on several tasks using a tactile map. Using various hand and finger combinations, they were tasked with such challenges as finding a landmark or figuring out if a road looped around. Overall, both blind and sighted participants performed better when using both hands and several fingers, although blind participants were, on average, 50 percent faster at completing the tasks, and even faster when they used both hands and all their fingers. "As we move forward with integrating tactile feedback into displays, these technologies absolutely need to support multiple fingers," Morash said. "This will promote the best tactile performance in applications such as the remote control of robotics used in space and high-risk situations, among other things." Difference between polarization and the dielectric constant? Two or three types of heat transfer?